"Dyson was one of the ancient natural philosophers, pre-Belt, almost pre-atomic. He pointed out that civilization is limited by the energy available to it. The way for the human race to use all the energy within its reach, he said, is to build a spherical shell around the Sun and trap every ray of sunlight." "There's an aspect of things which I find amusing: the flow back and forth between science and science fiction, which has been an important part of my life. I started out reading science fiction and then became a scientist, and that set the slant on my scientific work. I like to make connections between life and cosmology and astronomy. Science fiction raises all these interesting possibilities and has had some influence on science in the last 25 years – not only in the area of SETI, but also in other ways." Wells's First Men in the Moon and Stapledon's Last and First Men and Star Maker, Dyson recalls as being especially influential. He was born in Crowthorne, obtained a B.A. in mathematics from Cambridge University (1945) and was a Fellow at Trinity College from 1946 to 1949. 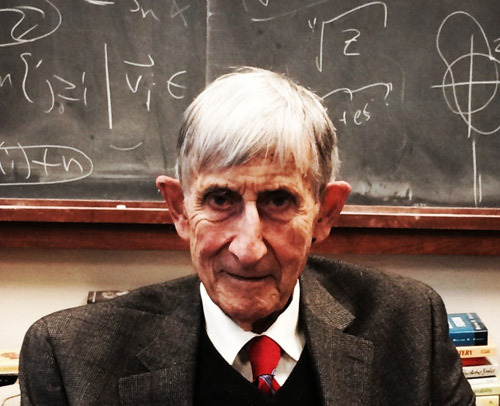 In 1947 he came to Cornell University on a Commonwealth Fellowship and joined the faculty there as a physics professor in 1951. He moved to Princeton two years later. Among his non-technical and autobiographical works are Disturbing the Universe4 (1979), Origins of Life5 1986), and Infinite in All Directions5 (1988). In another book, Imagined Worlds, he writes of distant timescapes populated by our descendants spread throughout the Galaxy in alliance with other intelligent beings. They would be unrecognizable to us, he says. In 2000, he was awarded the $1 million Templeton prize for progress in religion, the citation saying that "his futurist views have consistently challenged mankind to reconcile technology and social justice." 1. Dyson, F. J. "Interstellar Transport," Physics Today, 21, 41 (1968). 2. Dyson, F. J. "Search for Artificial Stellar Sources of Infrared Radiation." Science 131 (June 3, 1960). 3. Swift, David. SETI Pioneers: Scientists Talk About Their Search for Extraterrestrial Intelligence. Tucson: University of Arizona Press (1990). 4. Dyson, Freeman. Disturbing the Universe. New York: Harper & Row (1979). 5. Dyson, Freeman. Origins of Life, New York: Cambridge University Press (1985). 6. Dyson, Freeman. Infinite in All Directions. New York: Harper & Row (1988).